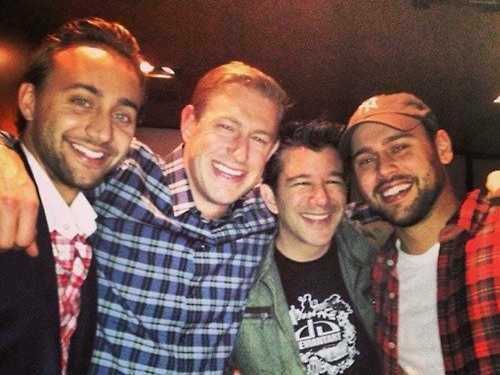 RyanGraves.orgRyan Graves, Travis Kalanick and Scooter Braun at SXSW 2013. Uber has two rather divergent reputations as a company. For consumers, it’s a fantastic, dead simple service that delivers cars on-demand. In the media, it’s seen as an arrogant, ruthless company that does whatever it takes to succeed. Those two reputations may be divergent, but they’re not mutually exclusive. One may lead to the other. We obtained an internal Uber presentation that sheds some light into how the company operates, and what it thinks of itself. It also helps explain how Uber’s do-whatever-it-takes attitude may have led to its success. All employees are rated annually by themselves, their managers, and their peers on these traits. Their scores can directly influence their compensation and bonus recommendation for the following year. For managers, there’s a higher emphasis on “scale” and “super pumpedness” in these internal reviews. “Super-pumped” is an Uber term that goes back to the startup’s first year. When Travis Kalanick replaced stand-in CEO Ryan Graves in 2010, Graves told TechCrunch founder Michael Arrington he was “super pumped” about a move that sounded an awful lot like a demotion. “Personally, I’m super pumped about how well-rounded the team has become with Travis on board full time,” Graves told Arrington then. Graves is still a big-time executive at Uber who is on the company’s board, so going with the humble approach to the news was a smart way to go in terms of his stock options. 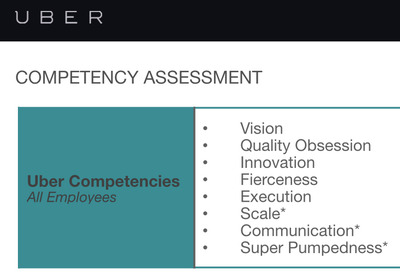 What exactly do “fierceness” and “super-pumpedness” traits look like for employees? One person familiar with the company’s recruitment strategy defines them as a common “hustle” mindset all employees must possess. Super Pumpedness — Bring energy and infectious enthusiasm to everything you do. For Managers: Motivate and inspire team members to perform their best, and stretch themselves professionally. Fierceness — Be fierce. Do whatever it takes to make Uber a success, even when it’s hard and takes some risk to get there.